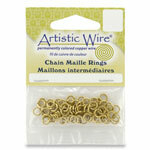 Artistic Wire Chain Maille Rings are ideal for creating virtually anything in the realm of Chain Maille. Made from Artistic Wire, these jump rings are precision cut and system matched for diameter and colour consistency. Rings can be opened and closed using the regular or bent Chain Nose Pliers.